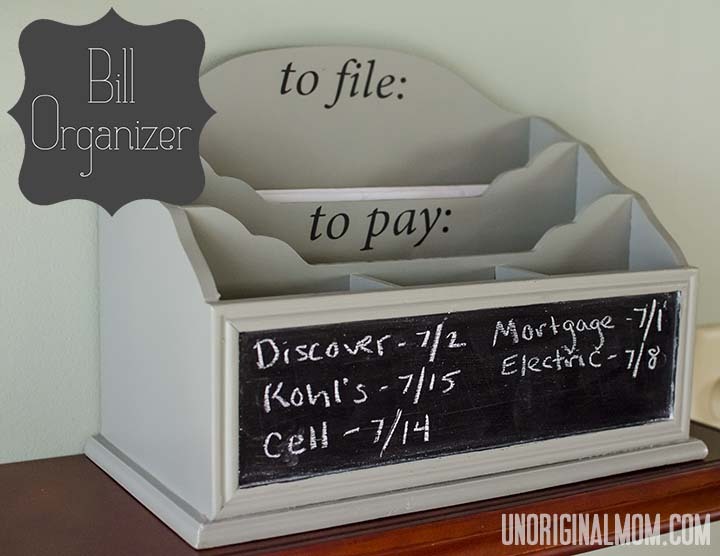 I’ve been looking for some type of desktop bill organizer as a solution for our paper clutter for a while now. My husband and I share a desk, so it frequently gets covered with lots of miscellaneous papers…bills, my blogging binder and papers, notes from worship team planning, and lots of other stuff! Our “procedure” for keeping track of bills that need to be paid was to put it near the computer keyboard so we would keep seeing it until someone remembered to pay it. Not a very efficient (or always effective) process! So last week, I found a plain gray wooden organizer at Home Goods (love that store) and knew with a few tweaks I could make it exactly what I wanted! A sad story: I took several pictures of the organizer throughout this process…there was a before picture, and pictures of the vinyl going on, and painting the chalkboard…but they all got deleted from my camera accidentally :-( So you’ll just have to use your imagination for what it looked like at first…it was very lovely, but all plain gray. 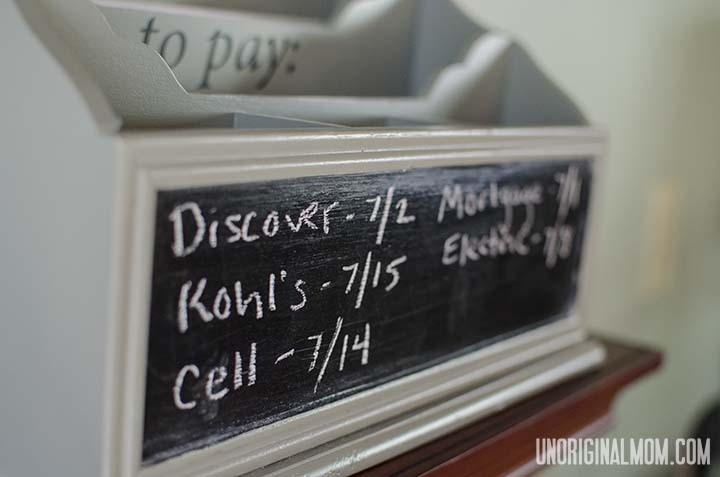 Then, I decided to use chalkboard paint to give us a place to keep track of when upcoming bills are due. Side note: we NEVER carry a balance on credit cards. We mostly use our debit card or cash, but use the Discover card for gas and a few other things. The only store credit card I have is for Kohl’s, and again, we never carry a balance on it. This was the perfect solution to keep important papers from getting lost or misplaced! 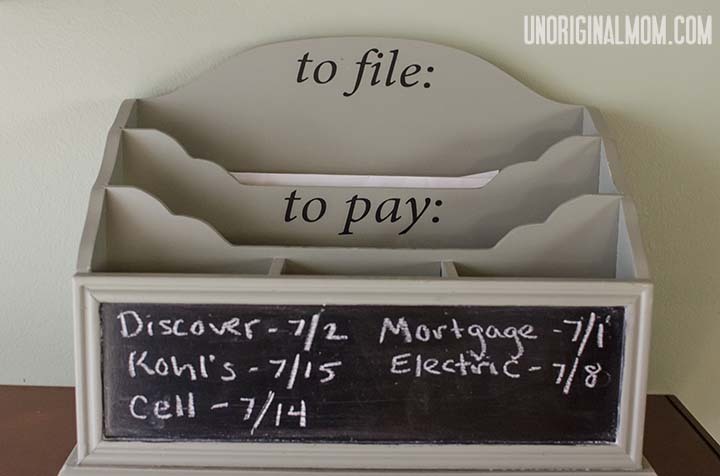 It keeps the desktop *mostly* clear of clutter and helps us remember what bills are coming due. And the best part is, it was an easy makeover that turned out great! I love how it looks! This is genious!!! I have an organizer just like that. Just need to add labels and chalkboard. Thanks! Love this idea. I am always throwing the bills in a drawer and then forget about them. This would work out so much better! I have a Silhouette on it’s way and can’t wait to use it! Glad to hear you had fun using vinyl! Thanks, Bev! Vinyl is SO fun…and it’s so easy to make professional-looking projects! I just made some labels for my laundry room yesterday, they took 10 minutes and look great. I am officially addicted :-) You will have a blast with your Silhouette! What an excellent idea!! So very cute!! Haha SO true! Something like this would be great to keep track of when signed permission slips and other papers need to make it back to school – and keep them all in one place to just load them back into the his backpack on the way out the door! So cute! I love the chalkboard idea! What a clever solution for an every day problem. This is so smart! I’m always forgetting important dates and this organizer would be perfect! How do you buy this are you selling.